Lily joins Dave Hansen for her fifth season! With 4 years of guiding experience and certification in First Aid, Wildlife First Aid, and CPR, Lily is a pro. An east coast transplant, Lily grew up in Brunswick, Maine. In college she studied health science and public health at Northwestern University. She went on to get her masters of education in science from Western Governors. When Lily isn’t on the river, you can find her mountain biking, gardening, cooking, running, enjoying local music in town, eating at King Sushi, or spending time with her german shepherd, Ranger. Additionally she loves hiking to Table Mountain and Delta Lake. During the school year she teaches at Jackson Hole Middle School. If you want to see wildlife, you’re in luck. Lily is one of very few guides that have seen both mountain lions and bears on her tours. Lily encourages her rafters to ride the bull, trust their guides, and of course, WEAR SUNSCREEN!! Alex joins Dave Hansen for his third year. Alex’s 11 years of guiding experience in Maine, Costa Rica, and New Zealand, makes him one of our most experienced guides. From North Yarmouth, Maine, Alex moved to Denver where he attended the University of Denver to study International Studies. Alex enjoys kayaking, skiing, hanging out with friends, paddling, exploring new places, and eating at Ocean City. He is also one of a couple guides who works a mullet! If he’s not on the river, he is most likely driving on his way to the river. Alex encourages his guests to dress warm, have fun, and not stress! Cameron joins Dave Hansen for his second year of guiding! From Reno, Nevada, Cameron attended University of Nevada- Reno where he studied Mechanical Engineering. After graduating from college, Cameron needed adventure but a drought left California without any snow. In pursuit of snow, he made his way to Jackson. Cameron likes skiing, mountain biking, and climbing. He has spent four months on a bike tour of Europe and road tripped to hike, ski, and climb in Utah, Nevada, Oregon, Washington, and Canada. When he’s not on the river, you can find Cameron eating at Thai Plate, The Kitchen, or Melvin Brewery or climbing and skiing in the Tetons. Jessica is joining Dave Hansen for her fourth season! She has three years of guiding experience and Wildlife First Aid certification under her belt. Jess is originally from Jackson, WY but spends her off season in Colorado Springs where she attends the University of Colorado (UCCS). While at UCCS, she studies Nursing and plays on the soccer team. If Jess isn’t on the river, you can find her on top of a mountain or on the soccer field. She loves hiking, camping, skiing, and eating at Local Restaurant and Bar. Jess’s number one rule for rafters is if everyone swims in the river, she will too. If you’re in her raft, get ready to swim! This is Billy’s first year with Dave Hansen. Despite being new to us, he’s no stranger to the rapids. Billy has nine years of guiding experience and is trained in First Aid, CPR, and Swiftwater Rescue. From West Bend, WI, he attended University of Wisconsin Stevens Point where he studied Forestry.Billy enjoys fishing, snowboarding, disc golf, biking, camping, boating the 3 mile whitewater stretch of the Gros Ventre River, and almost anything else that requires being in the great outdoors. If he’s not on the river, you can find him eating the ‘Buffalo Tar- Tar’ at The Local or trout hunting on Flat Creek. Billy loves telling jokes and making people laugh! He encourages his rafters to ‘slow it down’ and enjoy themselves! Jessie is joining Dave Hansen for her first season. She is from Santa Fe, NM. She attended Evergreen State College in Washington where she studied Sociology and Global Health. Jessie likes riding bikes, climbing, reading, crafting, playing board games, and daydreaming of where she’ll travel next. If she’s not on the river, you can find her at Cowboy Coffee, in the mountains, at the library, traveling in her 16 foot trailer, or napping outside. Jessie is awesome with children and has a lot of experience working with them. She loves to see kids comfortable in natural, outdoor settings. If you raft with Jessie, she encourages you to never forget how to play, to ask questions so all can learn, and to crack cheesy jokes. Although Danny has three years of guiding experience, this will be his first summer with Dave Hansen. A true east coast transplant, Danny is from Lancaster, PA. Last spring he graduated from Colby College in Maine where he studied geology. Danny likes to cook breakfast, explore GTNP, play with cats, and drive his minivan across the country. If he’s not on the river, you can find him eating at MacPhail’s Burgers, skiing in the Teton range, playing Settlers of Catan, or working as a ski tuner and rental technician. Danny encourages his rafters to bring their friends, paddle hard, and bring on the nature questions! Hunter is one of our senior guides as he joins Dave Hansen for his sixth year! From Beaumont, Texas, Hunter attended Ole Miss where he studied Political Science. Hunter is a volunteer Firefighter and EMT with Jackson Hole Fire EMS. He has kayaked down the Grand Canyon and even took a 10 day trip down the Karnali River in Nepal. In his free time, Hunter likes to kayak, ski, have cheeseburger picnics, and listen to Widespread Panic or Grateful Dead. If he’s not on the river, you can find him at the StageCoach Bar and Grill, ‘kicking it with the sons’, or maintaining his handlebar mustache. Hunter encourages his rafters to relax and enjoy the ride! Trevor is joining Dave Hansen for his first season, however being behind the oars is not new to him. 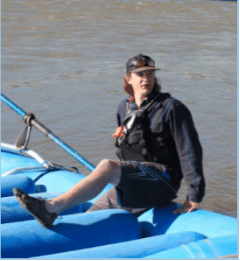 He has four years of guiding experience on the Animas River in Durango, CO and the Payette River in Banks, ID. From Natick, Massachusetts, Trevor grew up on a dog boarding kennel where he groomed and trained hunting dogs. Here he found a love for dogs and now owns a poodle.Trevor likes to ski, fish, mountain bike, and be outside. You can find him eating at Sweetwater Restaurant, making his own whitewater guide paddles, oars and drift boat, or on the skating rink throwing some axels and spins. With his guests, Trevor likes to talk about the ecology of the natural world. He has warned us that he has some games and jokes up his sleeve, so get ready! Nolan joins Dave Hansen for his first season. Nolan is a true Midwest transplant. From Traverse City, MI, he attended University of Colorado- Boulder to study International Affairs. He even had the chance to study abroad in Valparaiso, Chile. Following school, he spent a year guiding on the Roaring Fork River in Colorado and Arkansas rivers. In addition to his years of guiding experience, he is trained to perform CPR, First Aid, and Advanced Wilderness First Aid.When Nolan is not on the river, you can find him dreaming about ski lines, mountain biking, climbing, hiking, or completing the Ski tour in the Grand Tetons. Even a compound tib/fib fracture can’t stop him! This fall, he plans to travel to Southeast Asia or South America. Nolan encourages his rafters to enjoy the time they have on the water because you never know when you will be out there again. Tyler is joining us for his third year at Dave Hansen. Although he calls Seattle, Washington home, he knows his way around the Snake. During college, Tyler attended University of Puget Sound to study religion. When Tyler isn’t on the river, he can be found running, biking, fly fishing, climbing, or eating at Brew Pub. One interesting hobby of Tyler’s is building bamboo- frame bikes. When Tyler wants to get away, he travels in his 16 Sunrise trailer and escapes into the mountains.Tyler loves to answer rafter’s ‘dumb questions’ so be sure to think of some good ones and ask them! Cameron returns for his second year with Dave Hansen. As a certified EMT and 4 years of guiding experience, Cameron knows what he’s doing. After moving from his home of Vail, Colorado he attended the University of Utah to study Health Sciences.Cameron has worked for a medical research company that specializes in giving unapproved medications to humans and collecting the data. He is currently transitioning into a new position as an English teacher in Shanghai. In preparation, he has started learning Mandarin. When Cameron isn’t on the river, he can be found reading, biking, hiking, skiing, and eating at Thai Me Up. Cameron loves to hear jokes (even if they’re lame guide jokes). He encourages his rafters to not be shy, to jump in the river, to ride the bull, and to have fun! Cassie is joining Dave Hansen for her third year! From West Virginia, Cassie attended The Art Institute of Colorado where she studied Fashion Retail Management. Cassie enjoys rafting, kayaking, skiing, hiking, climbing, and biking. Her favorite activities in Jackson include buffalo tipping (we do not endorse this!) 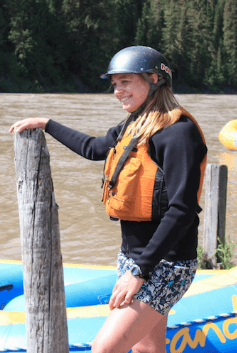 and eating at Local.During the winter, Cassie works as a ski instructor, travels, and completes multi- day raft trips.Cassie is always on the river so we always know where to find her! CT joins Dave Hansen for his third year of guiding! From Baltimore, Maryland, CT attended Franklin and Marshall College in Pennsylvania. While in school, he studied Business and Geosciences while starting on the college’s football team.CT is the fourth Clarence Talmage Marsh in his family. He enjoys biking, skiing, going to the movies and attending concerts. If he’s not on the river, he is probably at Chick- fil- A or Lucky’s Market. During the offseason, CT spends his time traveling and biking. CT encourages his rafters to do boat flips. If you need help, you’re in luck- CT is a pro! Sandy is joining Dave Hansen for his first year of guiding! From Hanover, NH, Sandy moved to Colorado Springs where he attended Colorado College and studied Environmental Policy. Sandy became passionate about rafting after he took two trips down the Grand Canyon and a trip down the Zambezi in Zambia. Before moving to Jackson, Sandy lived in Africa where he played soccer and worked for Grassroot Soccer. When he’s not on the river, you can find him playing soccer, hiking, snowboarding, and eating at Calico Restaurant. Sandy encourages his guests to study up on their sports because he’ll have some sports trivia coming their way! Patrick joins Dave Hansen for his first year of guiding. From Dallas, TX, Patrick attended Dartmouth where he studied Anthropology. Patrick enjoys hunting, golfing, hiking, playing and coaching lacrosse, and watching TV with his Corgi puppy. He likes to hang out with his friends on the water during the summer and on a mountain during the winter. Anywhere that Patrick does not get cell phone reception is where he likes to be! If Patrick is not on the river, you can find him at The Bird for half price wing night, at Jackson High coaching Lacrosse, or you won’t be able to find him because he doesn’t have reception! Patrick encourages his rafters to take a swim and try out rowing for a bit of the trip! A lifelong lover of water, Blair was born on the bayou in New Orleans, LA, an alligator serving as her midwife. During her early infancy years, her wet nurse was a stripper from Bourbon Street and she was bottle fed hurricanes. Blair attended Sewanee: The University of the South in Sewanee, TN where she studied English Literature and Women’s and Gender Studies. She also played volleyball her first two years before deciding life was better as a retired Division III collegiate athlete. Three weeks after graduating, Blair packed her bags and drove out west to move to Jackson Hole. Although last summer she worked in the office for Dave Hansen, she is stoked to be on the river this summer as a guide. If she isn’t talking your ear off about how amazing New Orleans is, she might be able to point out a few bald eagles or at least point you in the direction of the best burger in town (Local Restaurant and Bar). When not guiding on the river, you can find Blair on the tennis courts, on a hike in GTNP, or in her bed binge eating ice cream.